Malcolm Gladwell is one of those rock-star writers in the social sciences who commands huge speaking fees wherever he travels, gets invited to weekend-long corporate retreats to share his deep journalistic insights, and sells a bazillion books every release, just on his name alone. I read his “THE TIPPING POINT” not long after it came out in 2002 (totally dug it), and a few years ago got his book “OUTLIERS” slipped into a corporate “goodie bag” given to me at a trade show – so I feverishly read it on the plane home. It was then that I decided I’m fully on board the Gladwell train, no matter how formulaic or wide-eyed-with-wonder his writing can be at times. The guy’s on the vanguard of the deeply probing, highly skeptical wing of the social science/journalism fusion that’s been so popular of late (see “FREAKONOMICS”, “THE WISDOM OF CROWDS”, reducto ad absurdum). So I bought his collection of New Yorker essays from the past decade to further my study into the human condition, and to get a finer point on why it is that we human beings can be such a conundrum sometimes. I’d actually read a good third of these essays before, during the five or so years I was subscribing to The New Yorker. That magazine just sat in unread piles every week, until I made the rule that I’d read one essay or story from each, and then throw the daunting stack into the recycle bin after I’d done so. If there was a Gladwell piece in there, well, that was usually the one that got read. The man knows his way around an essay, and when he takes on a topic that looks like dullsville – women’s hair coloring, say, or people who can magically calm ferocious dogs down – it’s usually time to buckle in. 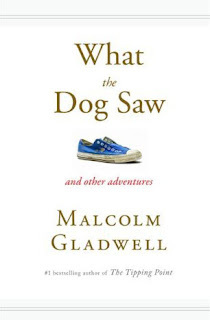 Gladwell usually positions himself as the rube from out of town who just has a few contrarian questions, and his simple, childlike logic leads him down a path of conclusions that upends all conventional notions of how life works. There are times when, as I said, this gets formulaic. After a thrilling essay or two, you see Gladwell’s story/setup/surprise twist/punchline/denouement structure coming from a mile away. And yet the man will flat-out make you think differently. Think you know why Enron failed? A classic story of greed, right? Perhaps. But Gladwell has a convincing piece toward the end of this book that says that their corporate culture of hiring the smartest, most risk-taking MBAs above all other considerations may have been the true root of what did them in. There’s a similar piece about hiring people to work in your company, and how we all make snap decisions about people we meet, just on the basic of their handshake or the initial 30 seconds of charisma they showed or didn’t show – and why that’s “wrong”. Except Gladwell’s also good at making you see both sides of a quandary as well, and that piece in particular had me wondering whether I should be trusting my gut when I meet someone new, or giving everyone a months-long benefit of the doubt. Because of its essay structure, “WHAT THE DOG SAW” is a book you can pick up and put down over a long period of time; in fact, I bought it the week it came out in late 2009 (I had just finished “Outliers” and was riding a Gladwell high) and just finished it last week. It doesn’t make it any less interesting, though, and this is one millionaire social scientist that deserves the coin and the accolades being thrown his way. "THE ART OF THE STEAL"